Since last Thursday’s post here, reporting the Cambridge Yatra in support of Burma, a number of other FWBO Centres and individuals have organised their own actions. In Brighton between 300 and 1,000 people joined a Dharma Yatra, walking silently between the Palace Pier and the Hove Peace Statue; Interestingly, the organisers estimated 300 and the local paper 1,000! 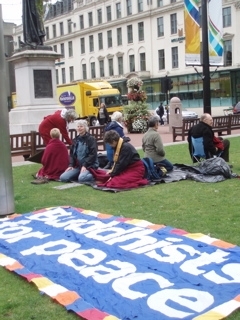 In Glasgow the ‘Shambolic Warriors’ met to ‘Sit in Peace’ in George Square (see photo); and in San Francisco a women mitra organised her own ‘very quiet gesture of non-violence’ through San Francisco's financial district on Friday afternoon. “I felt deeply peaceful and connected in an unusual way with the suit-and-tie commuters, the dates on their way to supper, the bike messengers gathering for the Critical Mass ride, the prostitutes leading their johns into the public toilet, the German tourists riding the cable cars. We walked for two hours. People noticed. It felt good. Did it make a difference? Who knows. But I had to do it. May all beings be released from their suffering”. There are plans for two more Brighton Yatras and a Birmingham Yatra through the city centre on October 14th and there will be an FWBO presence on the London march on October 7th. The Triratna Buddhist Community - formerly known as the Friends of the Western Buddhist Order (FWBO) - was founded in 1967 by Sangharakshita. It is now an international movement with activities in more than 20 countries, including India. The Triratna Buddhist Community is a non-sectarian Buddhist movement which seeks promote the practice of Buddhism in a form appropriate to the modern world. Triratna means "Three Jewels", specifically the Buddha, Dharma, and Sangha, which are the central foci of a Buddhist's life and practice. They've long been represented in our logo and we're delighted that our name will now reflect them as well.